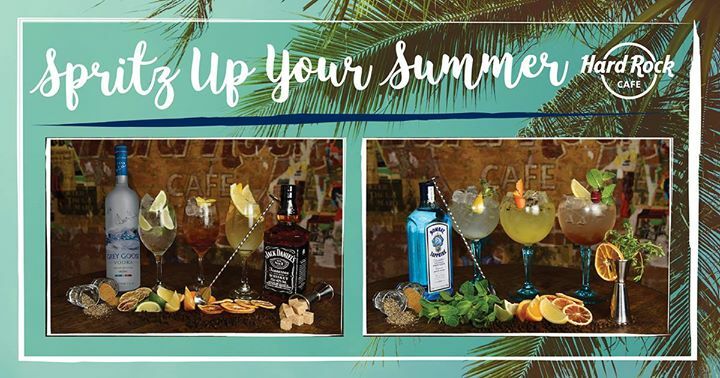 Bringing you a selection of refreshing cocktails inspired by long summer nights and classic rock ‘n’ roll! Fast becoming the quintessential celebratory fizz; this fresh and lively prosecco has an extra dimension with sweet floral elderflower notes from St-Germain and berry hints from Chambord. Chambord Raspberry Liqueur, St-Germain, prosecco, soda and lemon twist. No better combination exists than Grey Goose Vodka and the floral Elderflower notes of St-Germain. Heightened with a splash of prosecco – summer decadence in a glass. Grey Goose Vodka, St-Germain, lime wedges, prosecco and soda. All the familiar Whiskey taste of Jack Daniel’s,combined with orange and lemon. A great way to drink your favourite Tennessee Whiskey this summer. Jack Daniels Tennessee Whiskey, Cointreau Orange Liqueur, fresh lemon juice, simple sugar syrup, Lemonade and lemon wedges. Thyme is one of those under rated herbs, but shows its true credentials in this stunning gin and tonic. Fresh on the nose with the full complexity of Bombay Sapphire Gin. Bombay Sapphire Gin, Fresh lemon juice, Tonic and garnished with Lemon peel and a thyme sprig. A summer spin on the ultimate gin and tonic, with fresh berry notes offset by the light aromas of almond, lemon peel and mint. Perfect for summer afternoons. Bombay Sapphire Gin, Chambord raspberry liqueur, bitter lemon, garnished with a lemon wedge and a sprig of mint.